I remember being in Vegas and ordering some chicken tenders at a pub and being ultimately disappointed when chicken fingers showed up on my plate instead. Maybe it was the desert air or the anise flavoured IPA I was drinking or the fact that I was feeling all romantic-like since I was on my honeymoon, but I just liked the word “tenders” and I didn’t really think that would translate into the foodstuffs of little kids and restaurant chains. Oh well, live and learn. Now don’t get me wrong, I love foods like chicken fingers in that they are a means to an end and the end being sauce. Yes, I love me a good sauce and I’m not really that picky when it comes to the vehicle that gets me there. The other night I was visiting my friend Kristen and she had just pulled out some breaded baked tofu from the oven just so that she could have something to dip into some yellow mustard. Hmmm, that got me to thinking. Normally when I bake tofu, I marinate it and then use the end result in a yummy sandwich or to top some rice and steamed vegetables, but I liked Kristen’s idea better! So I whipped up some homemade bbq sauce and came up with these beauties. Kristen just went all white trash vegan and dipped the tofu in oil before dipping in the breadcrumbs, but I liked the idea of an egg dip better. I’m sure a vegan with health on her mind could figure out a less fattening solution. As well, use any spice combination you like, the tofu won’t mind at all. 1. Heat oven to 400 and spray a cookie sheet with vegetable oil. On a large plate, dump some panko crumbs and season with paprika, oregano & salt and pepper. Mix well with fork. In a separate bowl, beat 1 egg and dip each piece of tofu into the egg mixture and then the crumb mixture and place on cookie sheet. 2. Bake in the oven until the tofu is golden brown, about 30 minutes or so. Remove from oven, arrange in a pleasing pattern on a plate and serve with your favorite dipping sauce. This sounds really tasty, and I’ ll definitely try it. We have made tofu with the shake n bake packages from the store and it was pretty good as well. I don’t know what panko crumbs are though, could you fill me in? 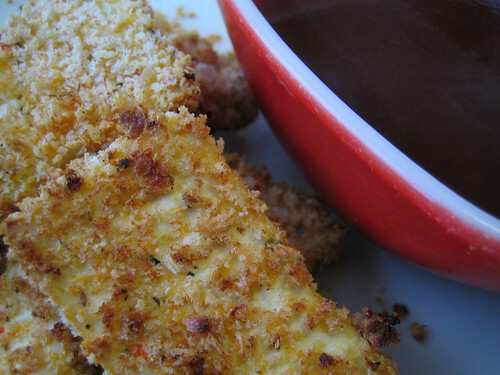 laural, panko crumbs are japanese breadcrumbs and they are super light and airy. they are most often used in tempura, but they taste great for anything breaded. Awesome! I am just getting into the world of tofu anf my skills are limited. This sounds like a definite winner. Thanks! First of all, I like your chicken tenders story. You’re right, it *is* a much more appealing name than “chicken fingers.” My mother would put every part of the chicken, including the feet, into her pot of soup, so whenever I hear the term “chicken fingers,” I picture the way those chicken feet looked when she pulled them out of the soup. Give me “tenders” any day!! Second, I like the tofu tenders. I’m always looking for new ways to use tofu, and this sounds delicious, particularly with some fabulous sauces. Thanks for sharing! This reminds me of Alton Brown’s “Filet o’ Fu” recipe, a bit. A suggestion for a vegan way to coat the tofu for panko adherence – Dijon mustard – if you like mustard a lot, use it straight, otherwise mix it with a little soy yogurt or veganaise. jana, take my word, this tofu recipe rocks! yes, tania, chicken tenders is just so much better than ‘chicken fingers’. it makes me squirm just thinking about it! dawna, good call on the dijon mustard and the soy mayo! yay tanvi! glad you are back to blogging. i’m looking forward to what you’ve got up your sleeve. Ah, you make me miss Vancouver. I moved back to Ohio recently and the lack of fresh foods and tofu is just…ugh. That and paying 16.99 for a pound of curry as to Vancouver’s friendly price of around 4.00 for a pound makes me truly cry. Anyways, back to Chicken Fingers. I once had volunteered for a Celebrity Banquet to watch the children with some friends. They were desperate for help, so that wasn’t the case. We got there early and if you could see the food they were serving the adults it would bring you to tears with it’s beauty. A Meal was included with our service (as well as a large charitable donation, but that’s another story) and when it came out…ketchup came out first. Then came the chicken fingers, not gourmet, not even fresh-made. Cheap nasty and very overcooked (can you say Chicken Stabbing Utensil?) dug from the back of the freezer chicken fingers. Even the kids didn’t eat them. Now…for the rest of my life, I will never again eat a chicken finger. UNLESS…I make it fresh my self, and it’s breaded tempura-style or with blue cornmeal. I might try these after I move to Montreal. oh, barista worker, that sounds horrible! stupid celebrity charity events!! yes, we’re pretty lucky here in vancouver…though i wouldn’t mind a trader joes. dare to dream! Thanks for the great recipe! My 2-year-old (a self-imposed vegetarian) actually ate it without complaint! have you any suggestions for dipping sauces? Niks, glad your 2 year old loved it! Anon…any dipping sauce you crave would gowell. sweet & sour, a garlicy mayo, honey-mustard or even salsa. hi there! I came across your blog and was really captivated by the Tofu Tenders. Btw, i’m also starting this website at mingchern.com. It’s pretty much dedicated to tofu. i’m pretty much compiling all sorts of info over the web, so it’ll be great if you can also drop by to give me some pointers. Alternately, drop me an email too! Hi Ming, panko crumbs are Japanese bread crumbs. Good luck on your search! i’ll toast some white bread and pound them. Try a combination of wheat germ and nutritional yeast as ‘breading’. Super tasty and vegan to boot. These were great- I used croutons that I pulverized in the food processor for the crumbs! The kids loved them and we will definitely make them again!